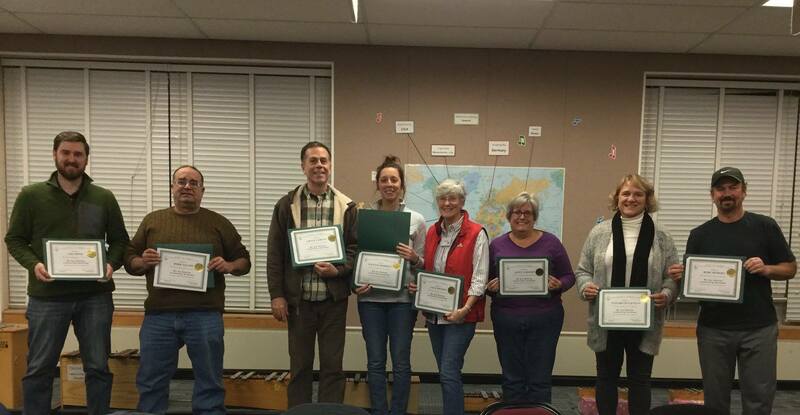 Congratulations to WE ARE HEBRON Citizen Leadership Academy’s First Graduating Class (left to right): Tim Cruse, Mark Falade, Chuck Lorenz, Kaitlin Hershey, Lilli Rhodes, Janet Fodaski, Elizabeth Gannon and Marc Rubera. Week 1 – Wednesday, September 26, Town Office Building, 15 Gilead Street, 7-9 p.m.
Week 2 – Wednesday, October 3, Hebron Fire Department, Company # 1, 44 Main Street, 7-9 p.m.
Week 3 – Wednesday, October 10, Town Office Building, 15 Gilead Street, 7-9 p.m.
Week 4, Wednesday, October 17, Town Office Building, 15 Gilead Street, 7-9 p.m.
Week 5, Wednesday, October 24, Douglas Library, 22 Main Street 7-9 p.m.
Week 6, Tuesday, October 30, Town Office Building, 15 Gilead Street, 7-9 p.m.
Week 7, Wednesday, November 7, Senior Center, 14 Stonecroft Drive, 7-9 p.m.
Week 8, Wednesday, November 14, Gilead Hill School, 580 Gilead Street, 7-9 p.m.
WE ARE HEBRON is a Citizen’s Leadership Academy that will help educate and recruit new town leaders and instill pride in citizens of what Hebron is and where it is going. There is a wealth of talent in the Hebron community waiting to give to the town. Often, citizens do not know how to offer their talents to help the town. The purpose of this program is to tap this wealth of talent by providing a course on leadership. The course will provide the foundation for new leaders and provide avenues by which a citizen can find their niche to channel their talents. WE ARE HEBRON will benefit the town by getting more citizens involved in the town government and services. To attract more citizens to leadership and volunteer opportunities, WE ARE HEBRON will provide a nexus through which citizens learn about the town and meet the leaders of the town. For more information please contact the Town Manager’s Office at 860 228-5971 or discuss with any member of the Board of Selectmen.